How many tarot card decks do you own? How many tarot decks are there? One of them confessed to only owning one tarot deck – The Goddess Tarot Deck – and she asked how many the others of us had. I said five, but I’ve owned more and given some away. One had two. One had six but she said rather self-righteously, I gave one away lately. I know someone who has dozens. Actually I know two people like that. So I’m not sure why we who own single-digit numbers of tarot cards should feel guilty. How many do Banyen Books have? Dozens at least, I’d say. I did a workshop recently on making collages inspired by a tarot card. 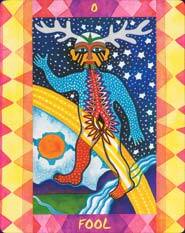 One of the participants recalled having a tarot reading where everything came true… unfortunately. And, no, she didn’t want to talk further about it. “I don’t know,” I replied, “My friends think of it as normal.” Because although she was careful not to ask if people who use tarot cards are normal, that’s what I heard. Here’s one of my favorite decks. This is The Fool. Isn’t he adventurous looking? And, of course, I have the Rider-Waite-Coleman deck and a new boo k called The Ultimate Tarot which includes full-colour images of all the cards. (I’ve started adding Pamela Coleman’s name to the more usual just Rider-Waite name of the deck. She did the illustrations. This is a favorite card. 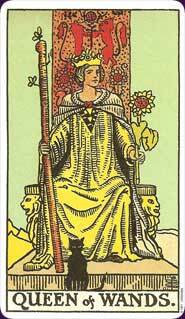 I love when I pull the Queen of Wands. Affirmation of my creativity. Will you be doing readings at the ACM and if so will you do mine? PS I know nothing about Tarot. Am I normal?